Home FixedWirelessPhones Karnataka Telecom Circle BSNL re-launched promotional offer for the sale price of GSM based Fixed Wireless Phone (FWP) in South Telecom Circle. 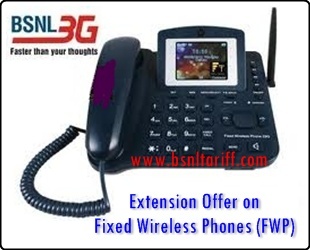 BSNL re-launched promotional offer for the sale price of GSM based Fixed Wireless Phone (FWP) in South Telecom Circle. State run telecom company Bharat Sanchar Nigam Limited (BSNL) has re-launched limited period GSM based Fixed Wireless Phone (FWP) Sale price as promotional basis across Karnataka Telecom Circle at Rs.1000/- (Inclusive of all taxes). Plan Voucher: Customer has to purchase the plan voucher within 7 days. The customer can choose Per second plan voucher 42 or Per-Minute Plan Voucher-37 as per customer requirement. Free Talk Value: Rs.125/- per month (Local/STD On-net) for 12 months. The Free talk value of Rs.125/- per month allowed for a month is to be utilized in the month for which it is allowed and no carry forward will be allowed. Recharge vouchers: All existing STVs/Topup applicable. The above offer will be implemented from 26-12-2013 to 25-03-2014. Note: All the existing STVs applicable for 2G service are allowed in this scheme.